If you like Terry Pratchet you should try Robert Jordan's series of the Wheel of Time, its effectively a more complex and better version of the Lord of the rings and consists of 14 books. i have been reading them since I was 12 and they are absolutely brilliant. Unfortunately Jordan (his pen name) died but they have now got Brandon Sanderson to complete the last book which Jordan left extensive notes and recording for. I have been reading it from the age of 33 , I don't disagree with froomes assessment but I did find that the series started to get a bit redundant after the 6-7 book. Still a good read but more of a really that again. The first book is without a doubt a must read for fantasy fans. And it does engage you to continue with the series. A plus is if you like to hold the book most of them are pretty cheap on the used market and there are several chances to get the original hardcovers for less than the paperback price at a lot of local bookstores. Spamming self book Though, I'd have expected a foreward for a red cat guide. I am reading Bruno Schulz's works, The Cinnamon Shops/The Street of Crocodiles and Sanatorium Under the Sign of the Hourglass again for the first time in many years... Gosh those stories are amazing, and the prose is just incredible. Painting with words. Recommend it to everyone, all ages. I am reading "The Kite Runner" and on the half I am saying nice book. Strong story about two kids Pashtu-Hazara relation, nice really. And by headway I mean p 30 - my dad's distracting me..
Mijn Duitsland (My Germany) by Geert van Istendael . Good book, shows lots of sides of Germany and how it has become the germany it is right now. "@RubyGold: Complete Sherlock Holmes free on Kindle http://t.co/myOnFODR"
Re-reading Catch-22 for the 80957392753290 time. Love the book and when I grow up I want to be just like Milo. Seen that book around, got my reading list sorted for a couple of months but after that would like to try those out..
"@marcopinotti: The english version of my book will be released soon in digital version on Amazon"
"@UCI_Overlord: Read the article on @marcopinotti's new book here http://t.co/5KX1lhBs and buy it here http://t.co/msCJChta You won't be disappointed." 5 MORE DAYS UNTIL THE GREATEST FANTASY EPIC OF ALL TIME COMES TO AN END. Robert Jordan's Wheel of Time series: The final volume, the 14th of the series will be released on the 8th of January. I have spent the last couple of months re reading the series and am now prepared for the release. I have read a wide range of fiction books and nearly all the great fantasy and sci-fi releases but this one for me tops them all. He died in 2007 whilst writing the last of his books. His wife then chose an up and coming and generally regarded as the soon to be next thing in the world of fantasy author Brandon Sanderson to write the last book. It was so extensive though that after seeing all the notes Sanderson was forced to publish it as 3 books. The last one entitled A Memory of Light is to be released this Tuesday. The speculation on the book has been overwhelming. Over the past couple of weeks I have immersed myself in it and I must admit that the detail which Jordan wrote with meant that the plot becomes so intriguing and bewitching as you analyse every single individual word. Sanderson has not a speck on Jordan and admittedly he does not have the unique genius, attention to detail and ability to define a character which Jordan has but he was aided by extensive notes and even written excerpts from Jordan written before he passed away. Also what I find fascinating is the remarkable depth of the series. Specifically the characters are based on so many parallels from many different inspirations and each of them are integrated within the series so effortlessly. The series draws on numerous elements of both European and Asian mythology, most notably the cyclical nature of time found in Hinduism and Buddhism, the concepts of balance, duality, a matter-of-fact respect for nature found in Daoism, as well as a creation story similar to that of Christianity in "The Creator" (Light) and "The Dark One". It was also partly inspired by Leo Tolstoy's War and Peace. "@faydra_deon: j. 100 free #ebooks on Barnes & Noble: http://t.co/pyjT0jKI #nook --Updated regularly to remove non-freebies"
Re-reading Sebastian Faulks - Human Traces. Deals with early psychiatry, the divides caused by the first war, and the interplay between the two main protagonists. At 600+ pages it's not for the faint-hearted but is never tedious... heartily recommended. Me too - and I want to stop! "@alaindebotton: Writing a book is like telling a joke and having to wait 2 years to know whether or not it was funny"
It is a true lie that "everyone's got a book in them". Equally, books are very fashionable at the moment. Everyone's writing one, it seems. If you could write a book, what would be the title and subject? If we each wrote one, what would it be? A compendium of JSG's truisms, unintelligible prophesies and newly-minted phrases like "head shacking". How studying the effects of doping led one man to buy, sell and use dope himself in unwholesome quantities, thereby proving that one addiction begets another. The triple double Tour and double single Giro winner from Pinto shares his recipes with his number one fanette. By telephone. Off-season also means resurrecting a lot of deeply unsuccessful threads. I'm reading Isabel Allende's House of the Spirits at the moment, which so far bears a vague resemblance to Marquez' beyond brilliant One Hundred Years Of Solitude. The story traces the progress of four generations of a family against the backdrop of Chilean history. I just finished The Master and Margarita, a novel written in secret by Mikhail Bulgakov during Stalin's rule. Discovered later and published posthumously, it is a profound work about how society can constrain itself. It tells a kaleidoscopic tale of a frustrated writer and his muse (both of whom we don't even meet for at least half the book), the trial and death of Jesus Christ (the subject of the aforementioned writer's masterpiece) and the often hilarious chaos generated by a visit to Moscow from the Devil and his assistants (this subplot inspired the Rolling Stones' Sympathy for the Devil). The latter book I want to dwell on a moment longer because it is one of those seemingly few books that possesses the capacity to touch one deeply. It is a masterpiece and daunting in the extraordinary width of its scope but it also manages to be brave, sincere, intimate, funny and human. And yes I am not sure why I haven't read it previously.. I guess I simply couldn't be bovered..
Did you ever finish it Froome? I've finished by first Xmas book - Changabang. 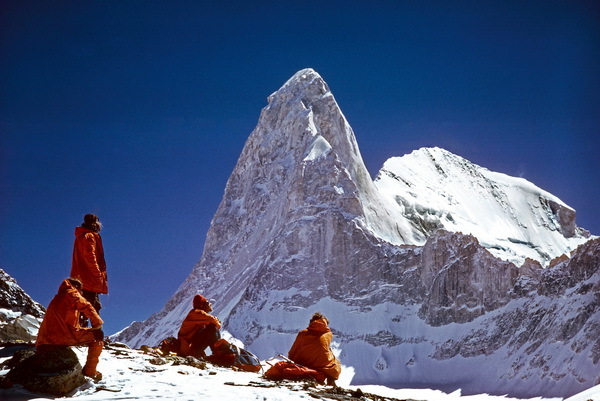 It was about the first ascent of the aforementioned mountain, by an Anglo-Indian team. Despite that picture, it seemed quite a straightforward climb (they took the "easy" route). They seemed to have more difficulty in getting to the (advanced) base camp than getting up it. The most interesting bit was a short passage about their cook - Sherpa Norbu. He'd seen it all from the 1930s onwards, being in groups with Ruttledge, Dyhrenfurth and Tilman amongst others. Tilman especially, seemed to have made a very deep impression on him. Needless to say, he thought the current climbers (as of then - 1974) were a bunch of namby-pambies in comparison. I'm reading Sartre's Nausea at the moment, the latest in a series of "let's read that and see what all the Fus is about" books. So far, before the philosophy bit gets started, I find myself rather disturbed by the protagonist's monologue, which describes his withdrawn life in a tedious and overly analytical fashion. Sounds too similar to my current situation. It was almost certainly an urban legend with no basis in fact - that is to say, the sort of thing people read in a Thomas Harris novel and quote for truth at lowbrow dinner parties or in drowsy, polish-kneed classrooms until it becomes fact - but one occasionally hears (at lowbrow dinner parties or in drowsy, polish-kneed classrooms) about a list of library lendings that triggers some alarm bells at Millbank or Quantico. This means that if you were to borrow Catcher In The Rye, L'Etranger, The Collector, Crime and Punishment (and perhaps others that have slipped my mind) from your friendly local book repository within an 18-month period, that is to say MPCC-style, you would automatically earn the right to a visit from a locally posted G-Man to sniff your trash. With that lengthy preamble, I must say that Nausea is shaping up nicely to join this particular bracket of loner literature and thus, although I have not read each of these within a single, contiguous period of 18 months, I may soon be the subject of such a visit. Except that, as lowbrow dinner partygoers and polish-kneed pupils would no doubt concede once slapped in the face with the cold fish of obvious, there are fewer and fewer public libraries receiving sufficient funding to retain a consistent library service in our cash-strapped times, so I did not borrow any of these books and therefore deftly deflected the scrutiny of public sector snoopers. As a potential candidate for the title of alleged serial killer, I know only too well that library funding is problematic because I bought my friend a couple of rare (and thus second hand) editions of seminal Stafford Beer texts for Christmas and in the flyleaf one of them was stamped and labelled as the property of the library of the presumably now defunct Economics department of the recently rebranded University of Glamorgan. My friend was full of joy on receipt but I sincerely hope she does not inherit two decades worth of overdue fines.